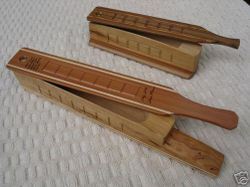 With auctions still on my mind from that last post, here's a follow-up on last week's eBay auction of a matched set of box calls made by Lamar Williams and Steve Mann. The auction also included a signed and numbered copy of Mike Marks's coffee table book Neil Cost - Magic With Wood. The entire collection received 16 bids with the winning bid coming in at $1,180. That's a lot of smack for a pair of box calls and a book, but then, serious collectors understand the value these things will achieve over time. With some of the late Costs's calls going for more than $11,000, you can bet there are avid collectors still looking for the next custom caller to fill his shoes--and enrich their collections. As you can imagine, the cost of bids jumped hard in the closing seconds with one bidder, who hadn't been on the scene at all jumping the price up just before closing by more than a couple of hundred dollars. In the end though, he got beat out by a bidder by the handle of csmarte who had originally bid $800 several days before. Mike Marks, author of Neil Cost - Magic With Wood, has teamed up with custom callmakers Steve Mann of Greenwood, S.C. (the late legend Cost's home) and Lamar Williams of Starke, Fla., to offer a first-of-its-kind collectible opportunity on Ebay. The trio have posted their first-ever paired custom box calls made by Mann and Williams. The calls were shaped from highly-figured black cherry that was cut in April 2004 from Marks's property in Upper St. Clair Township, Pa. The calls are reportedly in mint condition and come with the orignal packaging. 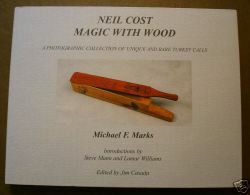 A signed and numbered copy of Neil Cost - Magic With Wood is also included with the calls. The book is No. 6 in the numbered collection and is the lowest of the title to be offered for sale. It is also only one of seven copies signed in brown ink by the author. Mann and Williams have also signed the book. Proceeds from the sale will go to scholarship funds set up by Williams and Mann. As of Friday morning, eleven bids had been placed with the current bid set at $755. There is roughly two days and 11 hours left with bidding ending on Sunday at 6 p.m. (PDT). If you're a serious collector, check it out now by clicking here. The value of collectible calls has gone through the roof in recent years and is just one more phenomenon associated with the amazing growth and interest in turkey hunting. I visited with Rick White of Hunter's Specialties during the recent NWTF Convention and he offers these tips on one call that every hunter should carry in his turkey vest. Watch the video by clicking on the image.